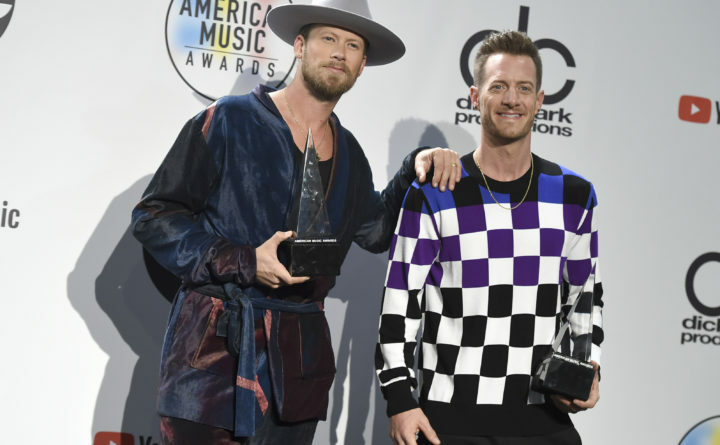 Brian Kelley, left, and Tyler Hubbard, of Florida Georgia Line pose in the press room at the American Music Awards at the Microsoft Theater in Los Angeles, Oct. 9, 2018. Country duo Florida Georgia Line will return to Bangor this summer for its fourth concert at the Darling’s Waterfront Pavilion. The duo comprising Brian Kelley and Tyler Hubbard will perform with guests Dan & Shay, Morgan Wallen and Hardy on Thursday, July 18. Waterfront Concerts hasn’t yet announced an official on-sale date for tickets, but Elissa Young, marketing director for the concert promoter, said it will be coming in the next few days. Florida Georgia Line previously headlined a concert in Bangor in 2016, opened for Kenny Chesney in Bangor in 2014, and performed as part of the Country Throwdown tour in 2012. The duo plays music often referred to as “bro-country,” because of its incorporation of rock and hip-hop elements, and its near-singular lyrical focus on subject matter like partying, drinking, driving trucks and women. More Waterfront Concerts announcements are coming in the next few weeks.